The beach at Horseshoe bay - Port Elliott. 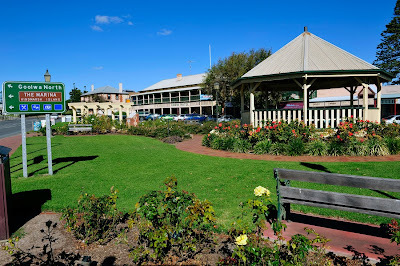 One of the parks in Goolwa in South Australia. 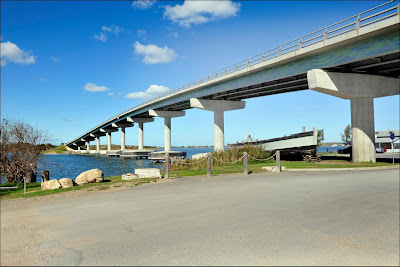 The Hindmarsh Island Bridge at Goolwa. Heidi Ing in the underground wine cellar of the historic Victory Hotel. Fleurieu Peninsula – Northern Section. Thursday the 13th May 2010 and our last full day at “The Links” resort. 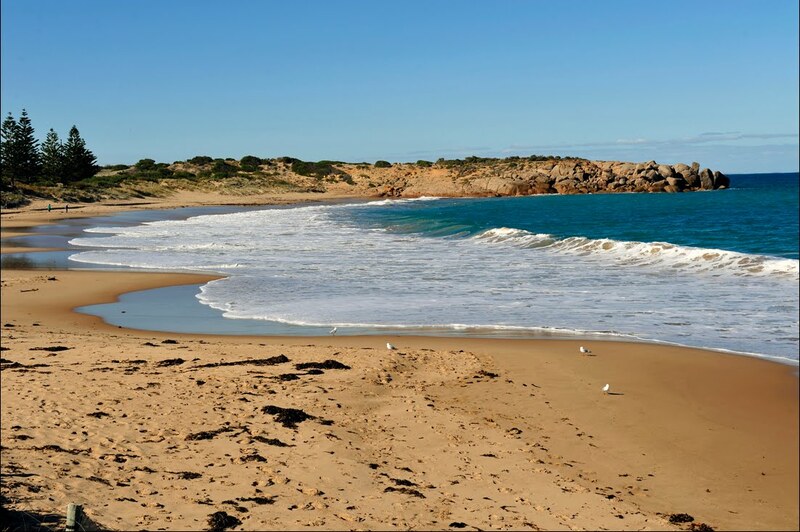 We took the opportunity to visit the northern section of the Fleurieu Peninsula. Our first stop was McLaren Vale, an area very similar to the Branxton vineyard region of the Hunter Valley. After coffee at one of the Coffee Houses, it was on to Goolaw on the Southern shoreline. 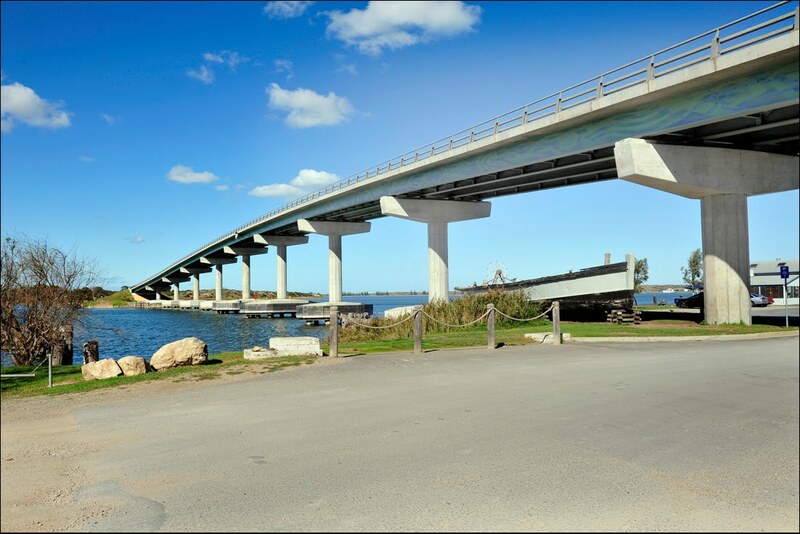 This is the point where the Famous Hindmarsh Island Bridge has been constructed to access Hindmarsh Island at the mouth of the Murray River. This was the bridge that was embroiled in controversy involving Secret Women’s Business with local aboriginal people. From Goolwa it was down to Port Elliot and Victor Harbour. 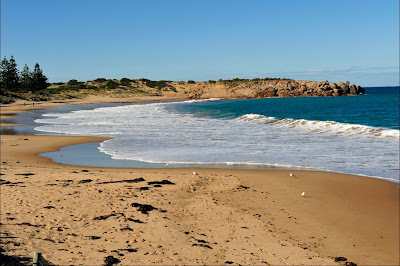 We then crossed the Peninsula to Yankalilla just north of Normanville where we were staying. This evening we had arranged to meet with Heidi Ing for dinner at the Historic Victory Hotel which overlooks Aldinga Bay and the settlements of Sellicks Beach and Aldinga Beach. This hotel has an underground cellar and when you purchase a bottle of red wine you go down into the cellar and select the bottle that you want. Prices start with bottles for several hundred dollars and go down to twenty five dollars. You then take it up to the bar, pay for it, and they open and decant it for you. Heidi is doing the Janz family history for the family that arrived in Adelaide in the 1870’s and I am descended from the family line that set up their new home in Mackay in North Queensland. We are comparing notes and trying to tie the two families together. We believe that there is a tie there but to date we have not been able to find it. The information has come down through the line of descendents verbally but we are hoping to find documentation to confirm it. Tomorrow we fly back to Singleton for a few days before returning to Adelaide next week to pick up our car and caravan to continue our trip.